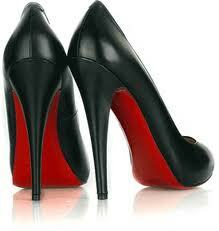 The lawsuit between Christian Louboutin and Yves Saint Laurent appeared to be a trademark battle set to end easily. YSL would be told they could not use red soles on their shoes because Louboutin has a trademark on the color and use by another designer would confuse consumers. We explained this logic and lesson in trademark not too long ago. Now it appears things aren't as black and white as they seem. There's some gray....maybe even red. Trademarks have a number of provisions to be met for use and protection, and color is no different. Colors can be trademarked when they serve the function of identifying a brand in the market. The Tiffany teal-blue boxes fall into this category. One would think the red bottom does as well, but it is not the story Mr. Louboutin is telling. He said the shoes have red soles "because red “attracts men to the women who wear my shoes." True and fine, but uh, did you check with legal on this? To protect the trademark, the designer must prove the red bottoms serve as an identifier for their products--which in the market, they do! Everyone knows and expects red soles from Louboutin. However, this case must be successfully made in court. Red soles by any other designer will cause confusion and hurt the Louboutin brand. We are anxious to see what happens next, and will keep you posted, step after red-soled step.